Week 2 of the preseason is officially upon us as the Houston Texans traveled to Carolina to face the Panthers. The game featured the much-anticipated debuts of Texans first round pick Deshaun Watson and Panthers first round selection Christian McCaffrey but it was a veteran receiver who stole the show early. Byrd shredded Texans CB Robert Nelson for four receptions – on four targets – for all 98 of his receiving yards, and a pair of touchdowns. Backup QB Joe Webb connected with Byrd for scoring strikes of 50 yards and another from eight yards that proved to be the game-winning score. Byrd posted an impressive 6.13 yards per route run average over 16 snaps in route. Benjamin would only see the field for nine total snaps but, if anyone required proof of his current condition, he left a very strong impression. Collecting both of his targeted passes from QB Derek Anderson, Benjamin stiff-armed his way to a 17-yard pickup, and followed that with an end zone fade over Houston CB Johnathan Joseph for a 23-yard touchdown. If incumbent starting QB Cam Newton were to miss time, this connection bodes well for the outcome. Benjamin posted an absurd 8.00 yards per route run on five total routes. The Panthers need support from the backup pass-rushers this season, and got just that from Cox tonight. He flustered Houston edge blockers all night, racking up two QB hits and four hurries on just 21 rushes. His pass-rush grade of 83.9 and run defense grade of 84.2 were both tops for Carolina. While Hall posted five total pressures against the Texans, his play against the run was not as strong, as his 49.9 run defense grade shows he still has significant work to do on that phase of his game. He also failed to recognize play-action rollouts to his side multiple times, which allowed Houston quarterbacks to survey the field on several uncontested throws. Watson’s debut was solid, albeit unspectacular. While he completed 15-of-26 aimed passes, he went just 4-for-12 on throws that traveled at least 10 yards through the air. This was largely due to him sailing several seam routes, something he was prone to do at Clemson as well. While he also seemed to struggle processing information in the secondary, and vacated the pocket early on a number of instances, the Texans have to be encouraged by the fact he didn’t force a single ball into a bad spot tonight. Walker put in a strong performance, surrendering just one hurry on 32 pass blocking reps. He also performed well in the run game, as his 81.2 run blocking grade was second-best on the Texans’ roster. 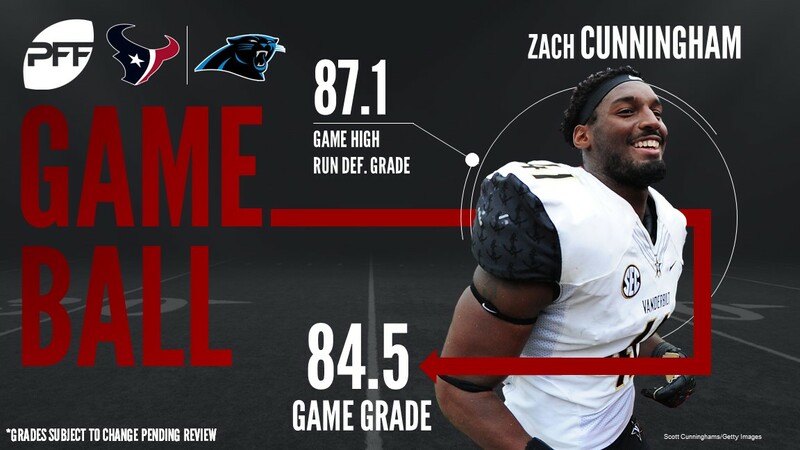 Cunningham didn’t leave notions of his progress to the imagination on Wednesday night, as he took the field in his first NFL game, and led the team with eight total tackles. Not only that, but he also closed out the night without missing a tackle, and permitted only four yards on 19 coverage snaps to average a paltry 0.21 yards per snap in coverage. Speaking of impressive performances in coverage, Moore saw 16 snaps without allowing a single reception, and also came away with the interception thrown by Panthers QB Joe Webb as time wound down at the end of the first half. His coverage grade following the conclusion of the first preseason game: 89.0. With his oustanding play against the run (87.1 run defense grade), the Texans’ rookie backer is tonight’s top player. He produced eight total tackles tonight (five of them of the solo variety), and in coverage gave up just one catch for four yards.